Cruise & Maritime Voyages, a British-based cruise line, launched in January 2010. The cruise line offers cruises that appeal to more mature travellers on primarily adults-only ships, emphasising interesting and varied itineraries that depart from UK homeports as well as Australia and Europe. Onboard, entertainment focuses on a solid enrichment programme and sedate evening fare. Cruise & Maritime Voyages prides itself on offering entertainment and enrichment programmes that are created specifically for a more mature British cruise passenger, so expect plenty of revues, pub quizzes and Bridge sessions onboard. Enrichment comes in the form of guest speakers such as destination experts and maritime historians. The evening shows feature accomplished dancers and singers, but don't expect the flashy fare that you find on many of today's new ships. There are also classical duos dotted about the ships, and cabaret-style performers onboard. 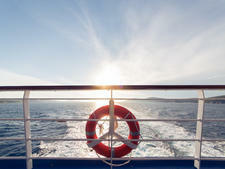 The clientele onboard is primarily British and over 60-years-old. Cruise & Maritime Voyages specialises in ex-UK itineraries on its adults-only vintage ships, with sailings to the Norwegian Fjords, Baltic and Mediterranean regions. The line also offers unique far-flung voyages to destinations such as the Amazon, while its newest ship, Columbus, will embark on a world cruise in 2018. It also offers river cruises on a handful of European river cruise ships. The line is very much aimed at the budget-conscious traveller and you'd be hard-placed to find a cruise line which offers cheaper sailings in the UK. There are five ships in the fleet, three of which are based in Tilbury, in Essex; while two operate out of other British ports, including Liverpool, Hull and Newcastle. The "newest" is the 30-year-old Columbus, which joined the fleet in June 2017 as the flagship. Starting life as Sitmar Fair Majesty in 1987, before being renamed Star Princess and christened by Hollywood actress Audrey Hepburn in 1989, the ship then moved to the P&O Cruises fleet in 1997 as Arcadia, replacing Canberra. The 22,000-ton, 820-passenger Marco Polo, which was built in 1965, will be well-known to anyone with a passing interest in cruise ships. 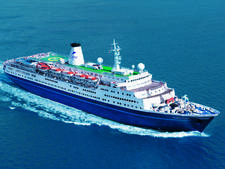 Marco Polo -- which has previously sailed for Orient Lines -- began operating for Cruise & Maritime Voyages in January 2010. Marco Polo does a decent job of catering to the single traveller. It has 12 single cabins (two inside and 10 oceanview cabins). 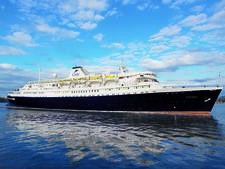 The 550-passenger Astoria was originally built as a transatlantic ship in 1948, named Stockholm. CMV spent a considerable sum refurbishing the ship, which began sailing from Bristol in 2015 to the Caribbean. The adults-only ship is in an Art Deco style, with 85 per cent of its 277 cabins featuring an ocean view. 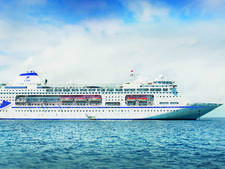 CMV signed a three-year charter of the 620-passenger Astor in February 2013. 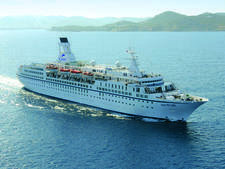 The 620-passenger ship (built as the sister ship to Saga Pearl II, though Astor is 25m longer), Astor was originally launched to the British market in 1987 before being bought by the German river cruising conglomerate, Premicon Group as the sole ocean-going vessel in the company's fleet. Cruise & Maritime's ships sail one- to 50-night ex-U.K. cruises to the Norwegian Fjords, the Baltic, Iceland, the British Isles, the Mediterranean, the Canary Islands, the Caribbean, the Amazon & West Indies and Australia. The programme offers departures from a variety of regional U.K. ports, including Hull, Tilbury, Dublin, Falmouth, Liverpool and Tyne. Astor sails northbound and southbound itineraries between the UK and Australia.